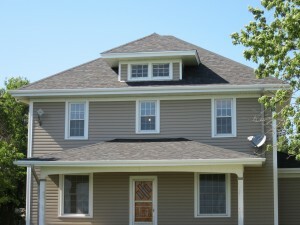 Not all vinyl siding is created with equal quality, but at Elite Exteriors, we offer the finest vinyl products to our customers in the Omaha, Nebraska, area. In fact, we pioneered seamless vinyl siding in 1995 with the introduction of our 28-foot siding panels assembled without the traditional clip system that creates unsightly splices. A year later, we partnered with Mitten to enhance our seamless creation with thicker-grade vinyl, developing an innovative seamless siding system that is still sought after by local homeowners to this day. Furthermore, you can be confident in your decision to partner with Elite Exteriors over other remodelers in town for several reasons. We are certified by the Vinyl Siding Institute, maintain an A+ rating with the Better Business Bureau, and send only the most experienced and knowledgeable house siding contractors to our job sites. Adhering to a higher standard of workmanship is what we do, and our level of customer care is unsurpassed. Contact Elite Exteriors today to receive more information regarding our durable vinyl siding, or stop by our spacious showroom in Omaha, NE, to view our products up close. Financing options are available to qualified homeowners.